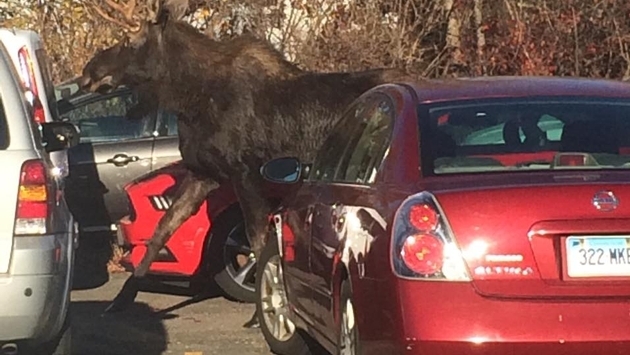 On Monday, a moose made a buzz on social media after it got itself stuck in an Enterprise Rent-A-Car parking lot at an airport in Connecticut. According to People.com, the wild moose was walking around the Bradley International Airport car rental parking lot when it was discovered. Authorities arrived on the scene and attempted to help the animal find its way back into the woods surrounding the airport. In order to move the moose safely back into the wild, officials from the East Granby Police Department and the Connecticut Department of Energy & Environmental Protection agency worked together to direct the massive animal out of the parking lot and into the woods. Post by Connecticut State Police. After the moose was freed from the Enterprise Rent-A-Car parking lot, it was seen sprinting away from authorities and into the woods. Just another day at an airport rental car parking lot in Connecticut.